Today, Martha and I will share with you some tea cups from our collection. We love sharing with all of you who have an appreciation for these little works of art. Today I am showcasing a pretty trio I found in Williamsburg, Va, at an antique mall that was the largest one I have ever been in. as well as all the gold trims. It has a bit of a fancy loop handle with a couple of scrolls detailed in gold. I feel like a princess holding this cup! Lately I have been finding these kinds of cups and I am delighted with them. It is unusual for me to find trios, so I was really delighted to see this set. The beautiful faux cake is by Cassandra Van Curen. See the shape under the edge of the cup? There are lines there that remind me of the Morning Glory Flowers shape. I love how this cup fans out towards the lip of the tea cup. This cup was created by Foley. As my cup last week also was made by them, and about the same time period, 1948-1963. Here I have placed the trio on a cake stand I found today at Goodwill for $3.99! 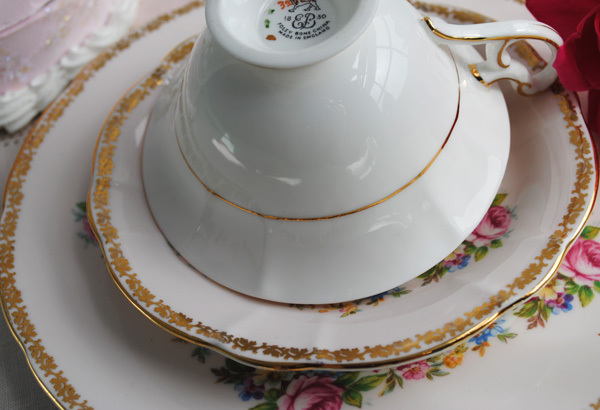 It has a gorgeous frilly edge and the embossed design on the base is repeated on top. I just love it! 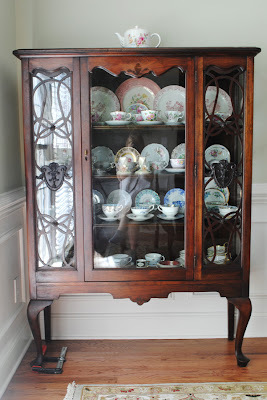 Here is something I have been wanting to share with you all...my new to me china cabinet! I found it at a Antique store, it was in pretty bad shape and really dirty. My hubby and I gave it a really good cleaning and he reconditioned parts of it. What drew me to it were the design on the two side panels. It really looks better! Now 35 sets of tea cups have a new home! Yay! I found this tea pot today at Goodwill as well. I do not usually buy dark colored anything! 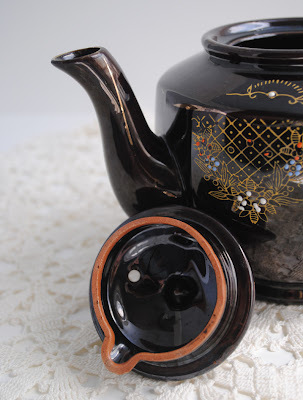 But this good sized tea pot has a depth to the glazing that makes it look like dark chocolate! The designed is raised. It was really dirty and I hoped it had no cracks and as it was was only $8 I took a chance on her. She cleaned up beautifully! I tested her for leaking and she is just fine. So I am thrilled with this find and wanting to know more about her. Design on the back is a little different than the front. With the lid off here you can see that she is not porcelain, but some kind of red clay. She does not have any markings at all. Do any of you know about her history??? I would really love to know. Thank you all so very much for stopping by. 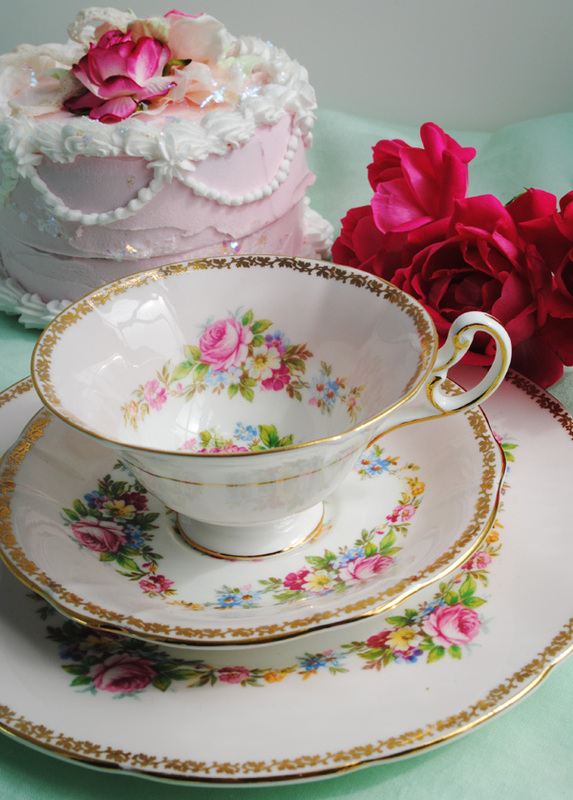 I am trilled to have you and I would love to come an see your beautiful tea cups! If you would like to join in, just go and create a post with a tea cup(s) you would like to share, then come back here and sign up with Mr. Linky. Check your link once it is up to make sure it goes to your post. I am also joining Wanda Lee today for Tea Pot and Tea Things Tuesday! What a beautiful trio you have. I love the colors and flowers. Good finds! The cabinet is very nice too. OMG!!!!!!!!! I have that teapot. It was my grandmothers How very strange to see a photo of one just exactly like it here. Mine sadly is missing it's lid. I cannot tell you how many cups of tea I drank with my grandmoter out of that teapot. Ohhhh, love your new cabinet! Just beautiful. and your new teapost was a wonderful find! I hope you are having a god week! Woth you and Martha, I always learn something new about china on Tea Time Tuesday. 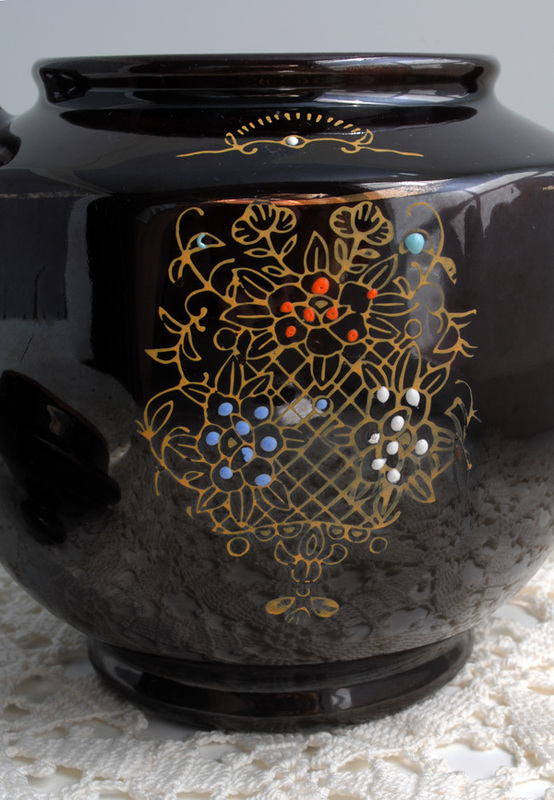 I love the trio for its beauty and the Moriage tea pot for its interesting design. Thank you for sharing your knowledge and for hosting this wonderful event. 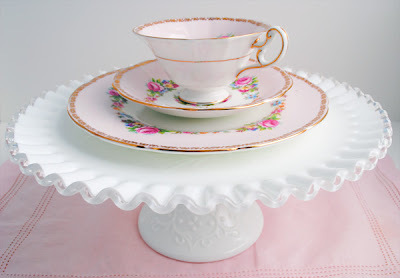 Beautiful teacup Terri, and your abinet is gorgeous, I am dreaming to find one like that! It is soo dreamy to have a place for your cups! Great post! Blessings. oh wow, i'm soo drooling at your teacup trio! so beautiful!! love the cake stand and your new cabinet is sooo gorgeous, i wish i had one to put my teacup collections, lovely teapot too! thanks for sharing and hosting another tea party! 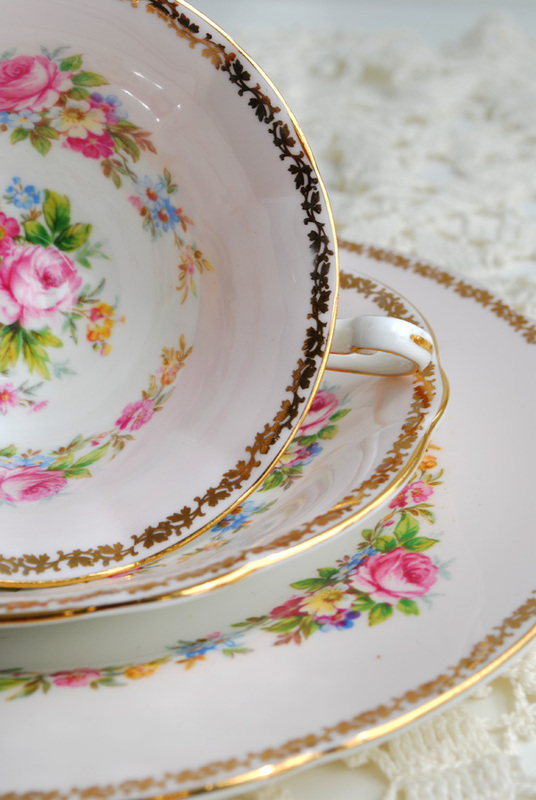 Your tea cup trio is so pretty! I love the delicate pink and florals! Wow, I just love the teacups, the teapot was such a great find! Thanks for hosting! A real Beauty, Terri! Williamsburg VA is wonderful, isn't it? I love the garland around the posy...I think it adds a dimensional beauty by adding more of those lovely flowers. I love the pink colors. I, too, am normally not attracted to dark colors, but I do agree that your teapot find is quite intriguing. It has a nice shape and design. Thank you for sharing your lovlies. what a beautiful tea cup! Your china cabinet looks great so you must of worked very hard to get it to look so pretty! Ah - you found "my" china cabinet!! !LOL I am on the search for another to display my growing collection!!! Love the sets you found in Wmsburg!! Drop by for tea today, if you get a chance!! 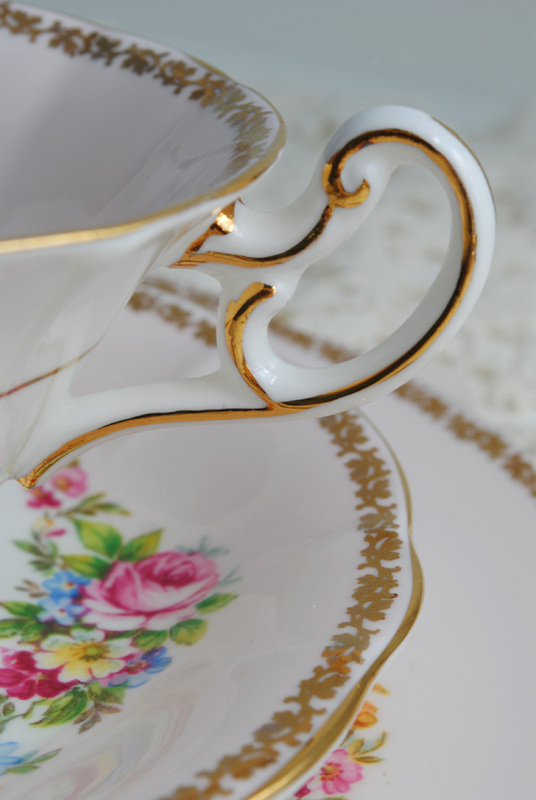 Terri, what a great teacup, so elegant and I bet it could tell many great stories. I love a good "goodwill" find! Thank you for hosting, have a wonderful week. i absolutely love that tea cup.. its so delicate and i need to find one for myself.. the pink is so delicate.. and wow you lucked out on goodwill.. im so happy you found such treasures that fit in with your collections.. I dream with that mall...Your trio is specially beautiful! And I love your chine cabinet,lovely! that trio is indeed most beautiful work of art. Very beautiful! The teapot is a great find! Thank you for sharing all these beauties with us! Have a wonderful week! Congratulations for your new cabinet. I loved it! 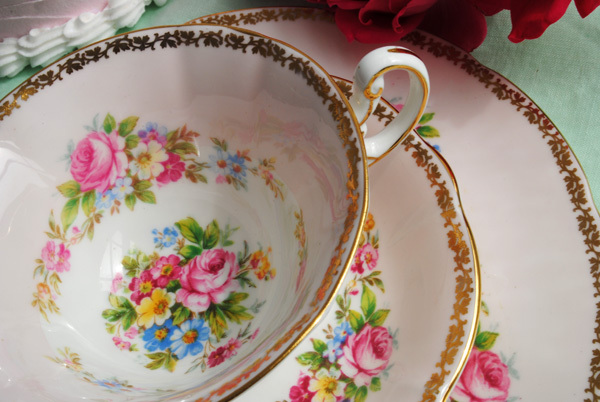 And your collection of tea cups, at least a part of it, looks gorgeous inside! 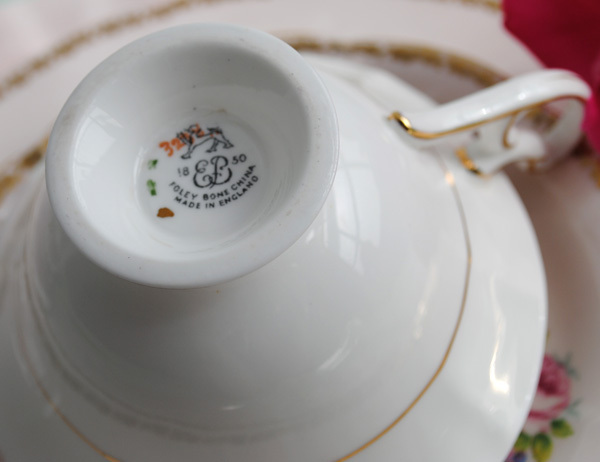 Not to mention the beautiful trio and the teapot, is so unusual, with an antique charm to it! Your trio is lovely, and the china cabinet is too - I have one that is very nearly the same! 'Jackfield' pottery a Victorian company which was based in Shropshire UK they are not marked. Their designs were very like that and are made of red clay. Here's a link with some information you might find interesting. I love your new teacup - the flowers are quite exquisite. Ohhhh your new China cabinet looks stunning. Lucky you on finding that one and being able to fix it up yourselves. What a beautiful tea cup, it is precious! gorgeous in flowers and gold edging! 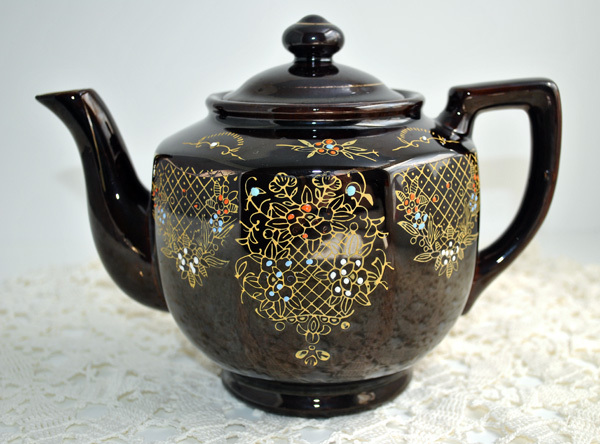 I love the black tea pot, yeah, I don't like dark to much either, but this is so pretty. It's made of "terracota", it looks oriental to me, they do a lot of things in this kind of terracota clay...specially tea pots and also, sometimes they don't have any markings. Thank you for sharing this great finds! Thank you for coming by and leaving me such lovely and sweet comments, I appreciate it very much! Love your 35 teacup display and love your blog. Nice to meet you! What a wonderful find! Your trio is just beautiful. I also like the cake stand you found at the second hand store, it makes me want to go looking through the ones in my town:)Like going on a treasure hunt! Just lovely! I love that little trio and I adore your new china cabinet. one of these days, I am going to get a picture of my meager little tea cup and saucer that I love! 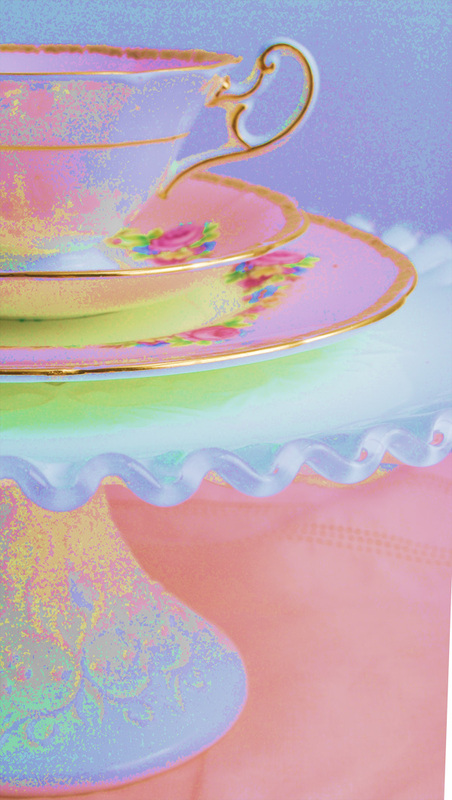 I know that I will be on the lookout for teacups when I have some time to go to some estate sales. I have caught the bug! I always remember when it is "tea cup tuesday" now! Terri, my jaw dropped when I saw your beautiful new china cabinet. That is pure perfection! And the tea cup is such a lovely treasure. It is very glad that you became the reader of my blog! I admire your talent and your amazing works!!! At you a fine collection of tea cups!!! Your teacup trio is beautiful Terri! I love the soft pink, and the flowers are so pretty and cheerful. What a wonderful find! In fact, you have lots of wonderful finds here. 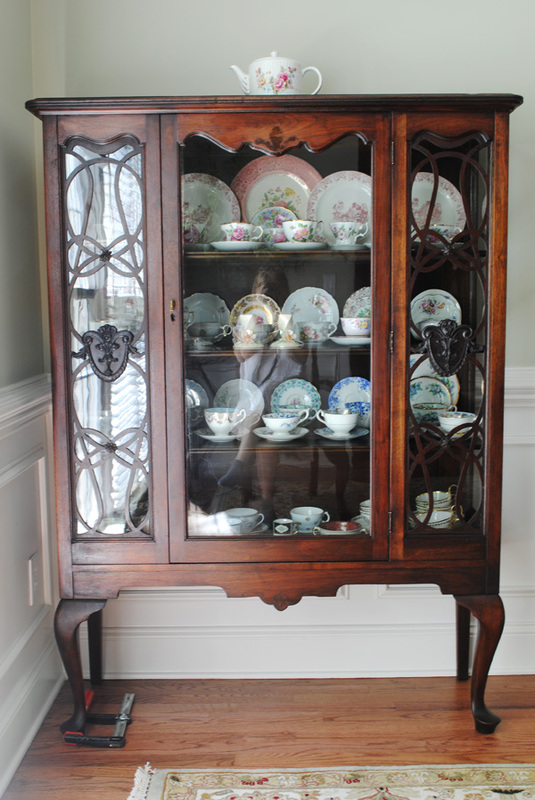 Your china cabinet is gorgeous! you always have the best selections to share with us! And your photos are so crisp and sparkly! What a great find your cabinet was and is perfect for some of your collection!! 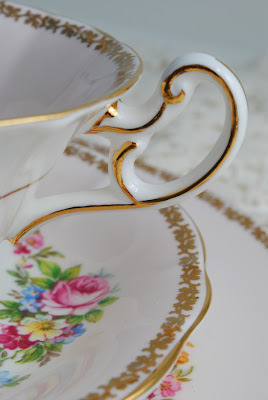 Happy Teacup Tuesday on Wednesday! Yay Hi Terri..another fab and delightful post! I LOve your teacup trio..the pattern looks like one of my grandmothers..just gorgeous...I love it..very charming! The teapot is pretty cool too! Always fun to find new finds! Your treasures are exquisite as always...thanks for adding "teacup sparkles" to my day! Shine on and have a beautiful week ahead my dazzling friend!! A lovely trio..beautiful design.A little treasure you've found in buying that teapot, a new beginning and memories for this little teapot! What a darling trio tea set! I love the soft palette...and yes, I do agree they are like little works of art! Maybe that is why I love collecting them too! love that aqua color!!! maybe someday i will find a teacup that color. Wow, I too am somewhat of a collecter of tea cups! Yours are very lovely and I agree, a trio is a wonderful find. This is the first time I have visited your blog and I am glad I found it. The matchbox is so sweet and I can just see it on my dresser. In the meantime, take care and Enjoy, Enjoy.